In the past two elections, New Mexico provided the thinnest margins of any state in the presidential race. But Tuesday, Barack Obama was declared the winner of the state’s five electoral votes by national news organizations shortly after the polls closed. Hundreds of people gathered at Hotel Santa Fe for a party sponsored by Democratic congressional candidate Ben Ray Luján cheered loudly when ABC News, being shown on large screens, announced Obama had won Ohio — a pivotal state in the 2004 election — and cheered even louder when Obama’s New Mexico win was announced. As it was in states all over the nation, the election was a mighty sweep for Democrats in New Mexico. Not only did Obama win, but Tom Udall won his campaign to succeed retiring Republican Sen. Pete Domenici. In the congressional races, Luján easily won his race in the heavily Democratic 3rd District. In District 1, which mainly consists of Albuquerque, Democrat Martin Heinrich was declared the winner by The Associated Press, as was southern 2nd District Democrat Harry Teague. In Santa Fe, a liberal community where Democrats outnumber Republicans 3-to-1 (and where there are fewer Republicans than people registered as “declined-to-state”), the Obama campaign seemed to be everywhere — canvassing neighborhoods, calling voters at home and, on Tuesday, standing at intersections, waving at cars with Obama signs. In contrast, the campaign for Republican John McCain in Santa Fe was next to invisible. 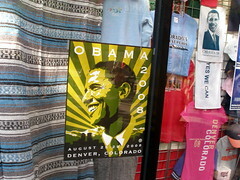 Howev er, some Obama campaigners in Santa Fe were fearful and pessimistic. One volunteer said campaign officials were worried the turnout in Santa Fe might not be high enough to offset McCain totals in the more conservative southern part of the state. The apprehension proved to be unnecessary, as Obama carried Santa Fe by more than 70 percent. There were no public parties scheduled in Santa Fe by the Obama campaign. While the major state parties had victory celebrations in Albuquerque, the Luján party was the biggest public election celebration in town. Naturally, local Democrats there were jubilant. A small group of women at the party weren’t able to vote, but were excited about Obama’s victory. The women, who came from Yemen, Saudi Arabia, Algeria and Morocco, were part of a group from the Middle East being hosted locally by the Council on Foreign Relations. Several wore Obama and Luján buttons, and some said they were getting calls from people back home — even though it was in the wee hours there — wondering whether Obama had won. 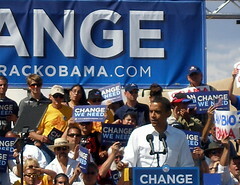 Obama’s win could have direct political repercussions in New Mexico. Gov. Bill Richardson has been frequently mentioned as a possible contender for secretary of state or some other top position in an Obama administration. Richardson shaved off his beard. Richardson repeatedly has said he expects to serve out the final two years of his term as governor. “I’m not looking for a job, and I haven’t had any conversations about it,” he said Tuesday night following several television appearances. Cabinet position or not, winning New Mexico for Obama was a top priority. “John Kerry’s still mad at me,” Richardson has said half-jokingly in various interviews this year when reminded about New Mexico going for Bush in 2004. But Richardson spent much time campaigning for Obama out of state. He’s been one of Obama’s top surrogates since March, when he formally endorsed the Illinois senator.